1. 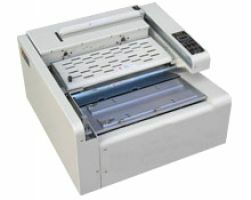 ZXJZ-20 Glue binding machine is a desktop binder designed for the office clerks. 2. 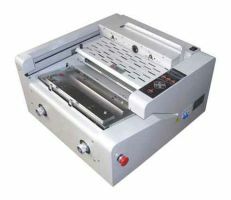 The machine is small in size, easy to operate and to maintain. It can bind bidding documents, regulation books, financial statements, thesis, meeting papers, bills and other documents. 3. 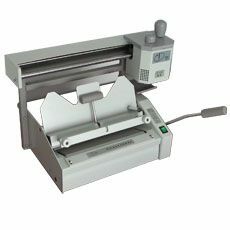 It is ideal for binding documents which is small in batch and there are many batches. 4. It will reach perfect book binding result and can make hardcover books. 1. The sector adhesive-brushing system is optimized; it can brush adhesive flatly and evenly. There is side-adhesive for firm binding, and pages don’t get loose. 2. Double heater can heat the adhesive fast and equally, thus avoiding the aging and carbonizing of adhesive. 3. 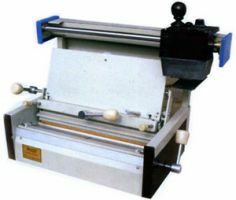 The adhesive can move on double rails, thus the adhesive is brushed evenly and precisely, avoiding the deviation brought by the sheet-metal structure. 4. Adhesive filtering device avoids the jamming of adhesive pot by impurity. 5. Clamping device is made from special material for better clamping. It is suitable for not only A4 paper, but also notepaper of the size name cards, etc without adjustment. 6. Positioning device for flying of hardcover can make the binding more easy and convenient.